Confirming a leak last month from the U.S. games ratings board, Ubisoft confirmed today that there's a new Ghost Recon coming to PSP, a welcome addition to the platform's thinned line-up. It'll be out in November. At the PlayStation blog, Ubisoft brand manager Nate Mordo establishes the game as a squad-based mission behind enemy lines in Sri Lanka, your elite fighting force up against insurgents. 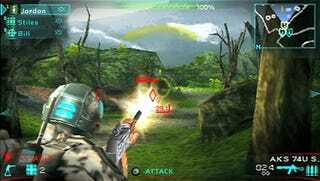 "For Ghost Recon Predator, our goal was to create a game that would deliver some of the classic Ghost Recon action moments from this fantastic franchise. We really wanted to make the player feel like an elite soldier surrounded by highly-trained teammates and include as many cool features as we could. Some of the features we're most excited about include character swapping, third-person cover and of course tons of customizable weapons and high tech gadgets, such as the RC drone." The Ubi manager confirms in the comments to the PlayStation blog post that the game's three-player co-op will work in short-range ad-hoc mode. It won't work over Wi-Fi. The game is set for a November release, nowhere near the next-year release of console and PC game Ghost Recon: Future Soldier, which we previewed in June.